• Latitude: The number of degrees north (or south) from the equator. • Orbital Altitude: The height above Mean Sea Level of an orbiting spacecraft. • Orbital Inclination: The angle that an orbit makes as it crosses the equator. Across the pond is an innovative rocket company that toils away in relative obscurity designing a revolutionary new space launch vehicle system while being out-shined by comparable U.S. companies such as SpaceX and Virgin Galactic. This launch vehicle design is unique in that it looks and acts like an airplane from takeoff to landing; it just so happens that this particular airplane can remarkably fly all the way into Low Earth Orbit (LEO)! And the best part? It’s reusable, unlike those other expendable launch vehicles. Nice! 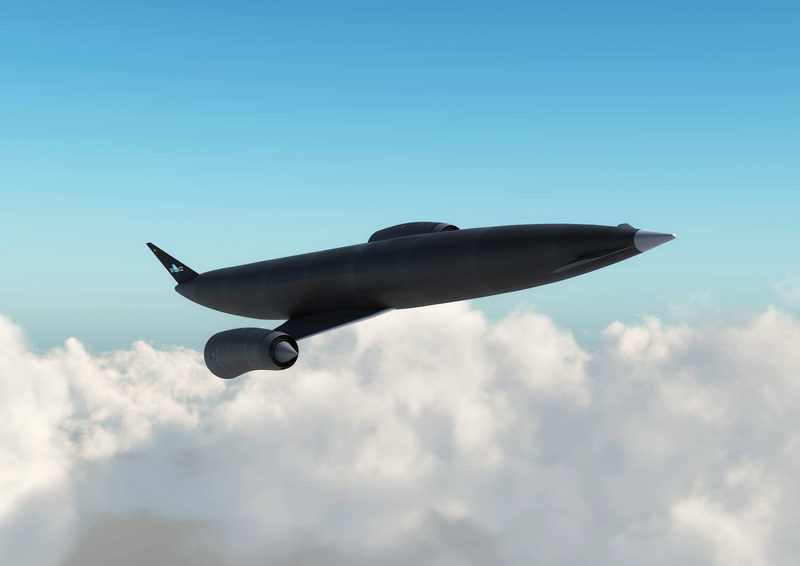 This futuristic rocket company is called Reaction Engines, Ltd. out of the United Kingdom (www.reactionengines.co.uk), and they want to build the Skylon spaceplane that would fly from virtually any airport on the planet, and incredibly, would not require an expensive launch tower to perform a liftoff! This spaceplane would operate just like any ordinary airliner, except if you want to operate this bird, you’d better call it a spaceliner! The REL Skylon spacepl -er- spaceliner is designed to have a payload bay just like what the US Space Shuttle had, albeit a bit smaller. Can we derive the equation of the payload capability of the REL Skylon? Sure we can! The students in the High School Algebra 2 class at The Learning Community Charter School (www.tlcnm.net) in Albuquerque, NM certainly did! 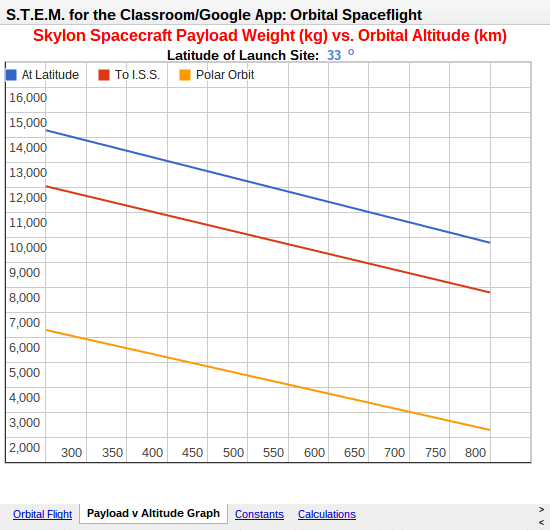 The horizontal axis represents the orbital altitude, and the vertical axis represents the payload weight. For the purposes of this exercise, we will be launching from – err – taking off from Spaceport America near Las Cruces, New Mexico, which is located at 33 degrees N Latitude. The orbital inclination will always be the same as the latitude of the launch site (unless, of course, you expend more propellant to go into a different orbital inclination), so the orbital inclination is 33 degrees. The blue line in the graph represents such an orbit. The red line represents an orbital inclination to the International Space Station (ISS) , and the yellowish-orange (orangish-yellow?) line represents a polar orbit. As we can see from the graph, it not only takes more propellant to go higher but to also change the inclination. Therefore (and again for the purposes of this exercise), we will only be looking at the blue line, i.e., the “at latitude” line. For example, the graph tells us that the lift capacity of the REL Skylon at latitude to a 650 km orbital altitude is about 11,000 kg (11 mT). The endpoints of the graph show us that the REL Skylon can lift 14,250 kg to 250 km, and 9,790 kg to 800 km. Putting this together, we get two points! 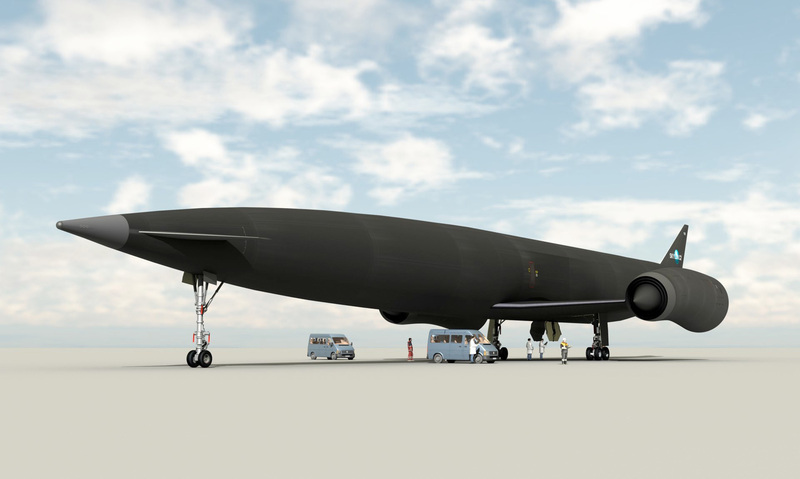 What is the lift capacity of the REL Skylon operating from Spaceport America to an orbital altitude of 400 km? The REL Skylon spaceliner could lift around 13 mT to a 400 km, 33 degree LEO from Spaceport America, which can be verified by the graph. For comparison, the SpaceX Falcon 9 has a published lift capacity of about 13 mT to a 28.5 degree LEO. The major difference, of course, is this one would be reusable, which would help drive the operational costs down. So, why are we still using throwaway rockets in the 21st Century again?